In addition to the Earth, astrology deals with ten planets, namely the Sun, the Moon (the two luminaries are considered planets in astrology), Mercury, Venus, Mars, Jupiter, Saturn, Uranus, Neptune and Pluto. 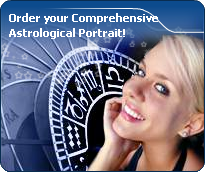 Each planet has its precise function in the natal chart, and represents a specific energy. The planet's action is influenced by the sign it tenants. It plays out primarily in the area of life indicated by the house where it is posited. The planets are divided into two classes: personal planets (or fast-moving planets, the Sun, the Moon, Mercury, Venus, and Mars), the most important in the natal chart, and collective planets (or slow-moving planets, Jupiter, Saturn, Uranus, Neptune and Pluto). Associated keywords for this dominant planet could be for example: concentration, examination towards essence, efforts, serious, honesty.